Startup focusing on robots that can be controlled over the Internet. I need a logo that can be used for my website and business card, but flexible enough to be used elsewhere (even on a t-shirt). It would be nice to have it in both vector graphic as well as a very high res version also. The design should be inviting, curious, interesting, fun, and approachable. I'll generally use it in color - but shouldn't look bad if printed in greyscale though. 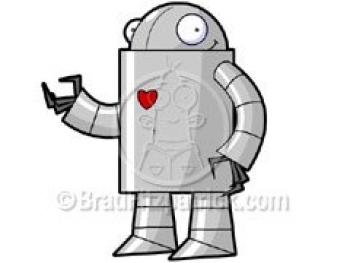 There should be a fun/cute image of a robot, plus the domain name of our website "goodrobot.com". Or if you want to go more "tech" and a bit more professsional instead of just "fun" that's fine with me too. It should not be too "cutsey" or over-the-top so that it would be unappealing to a professional. Interesting and/or inviting for a wide audience is what I'm looking for. Hobbyists, business professionals, consumers. Basically anyone who wants to rent, buy, build, or control, an internet controlled robot. fun, friendly, approachable, with appeal for a wide audience. I've assumed that GoodRobot.com should have capital G and capital R so the separate words stand out, but if you can make a case for something else or have another method of making the words stand out I am open to that too if it looks nice. Must be an original work with unlimited license to use.